Coming to a new church can feel quite daunting whether you have been a part of church for many years before or are coming for the very first time. Visitors to our church often comment on the warmth of the welcome they recieve here. We would love to welcome you too. Some prefer to meet with a smaller group of people either to explore questions of life and faith on an Alpha course or to meet with others for friendship, Bible study and prayer in one of our home groups. Please follow those links to discover more about these groups. Alternatively read on for an idea of what happens in our morning services. Our congregation reflects the diversity of Lower Morden and so you will find a mix of ages, nationalities and backgrounds within the church. We have those that like to dress smartly for church, those who feel more comfortable in jeans and many in between. The church building is found on Lower Morden Lane, opposite the Morden Brook pub, (formerly the Beverley). We have two buildings side by side but our Sunday services start in the newer building. We have a car park at the front of the building (Lower Morden Lane) and at the back of the building (Tudor Drive). If these are full then there is a free car park next door at the Morden Assembly Hall off Lower Morden Lane and ample on street parking. As you arrive one of our stewards will greet you at the door. They will be happy to answer any questions that you may have and to help you find a seat. Our morning service starts at 11:00 and starts with the whole church family together. After a few songs and a talk for the children and young people the younger members generally move out to their own group s for age appropriate teaching. We have a creche, a group for primary school aged children and a youth group meeting most Sundays. 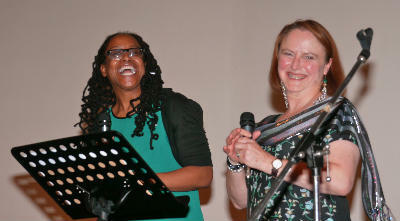 After the young people have left, the adults continue to worship with songs and prayer. During this time we also take an offering for those who wish to contribute financially to the work of the church. We don't ask visitors to contribute and there is no pressure to give. During this part of the service we will also listen to some Bible teaching. Most sermons last for about 25-30 minutes. To listen to a recent sermon please click this link and follow through to recent sermon. We usually finish between 12:15 and 12:30pm. From time to time we keep all ages together for the service. These times tend to be a little livelier and give more opportunities for people to get involved, though there is never any pressure to do so. Our all age worship can include drama, puppetry, videos and just about anything else. At the end of the service we have a selection of refreshments available, free of charge, at the back of the church. You are very welcome to come and get a drink. 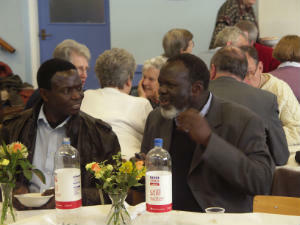 While the refreshments are being served some people like to take the opportunity to talk or pray with someone about something going on in their lives. Our prayer team are available at the front of the church for those who would like to do this. Our evening services usually start at 6:30pm and tend to be a smaller and more intimate gathering. We vary what we do through each Sunday through the month. Please be aware that on the second Sunday in the month we hold a youth celebration for those of secondary school age. This starts at 6pm and the location varies across the local churches and so there may not be a service at Morden Park that evening.